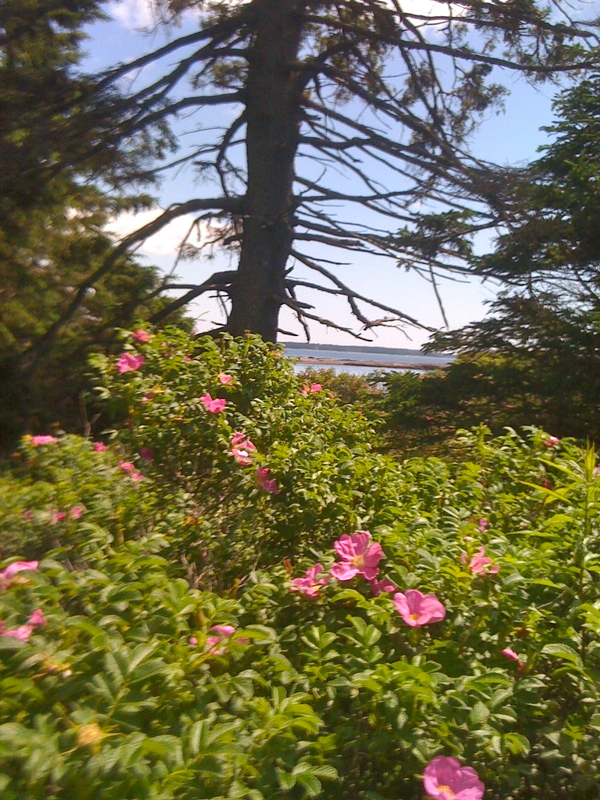 Bar Harbor’s Shore Path is lined by Rosa rugosa bushes. A Japanese native, these wild roses were introduced to Europe and America, not only for their ornamental value, but because of their extreme salt tolerance and hardiness, helping to stabilize dunes and preventing erosion in coastal areas. Their flowers, red, pink or white, are beautiful, and their leaves glossy green. But at this time of the year it’s their large rose hips that rouse the old hunter and gatherer’s instincts. When I was a child we picked rose hips mainly for their seeds – the perfect way to annoy classmates with surprise attacks from behind. Those seeds, thrust under the shirt, itched horribly, and were quite difficult to get rid of. Usually it’s our dog, Buffy, who decides when and where to stop, sniff (or do other things related to odors), but now I am the one who lingers among shrubs full of orange red rose hips. This year we have an abundance of fruits, so that I could pick and choose the fattest and ripest ones – not a meager harvest like last summer, when I was too late, and had to take whatever small, wrinkly fruit was left. 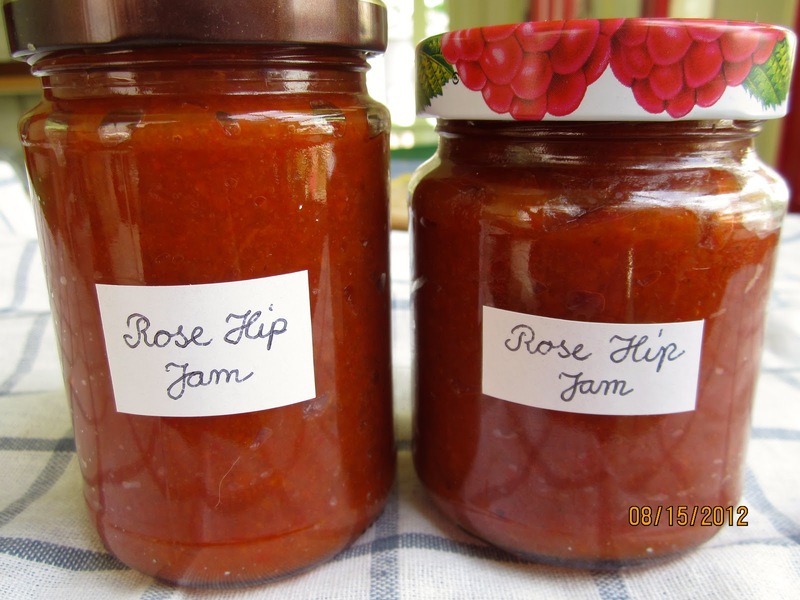 The first time I made rose hip jam was many years ago. Following a recipe from food magazine “essen & trinken”, I spent hours scraping seeds from the hips, until I was ready to drop the knife. The jam tasted good, but what a slave labor to prepare it! 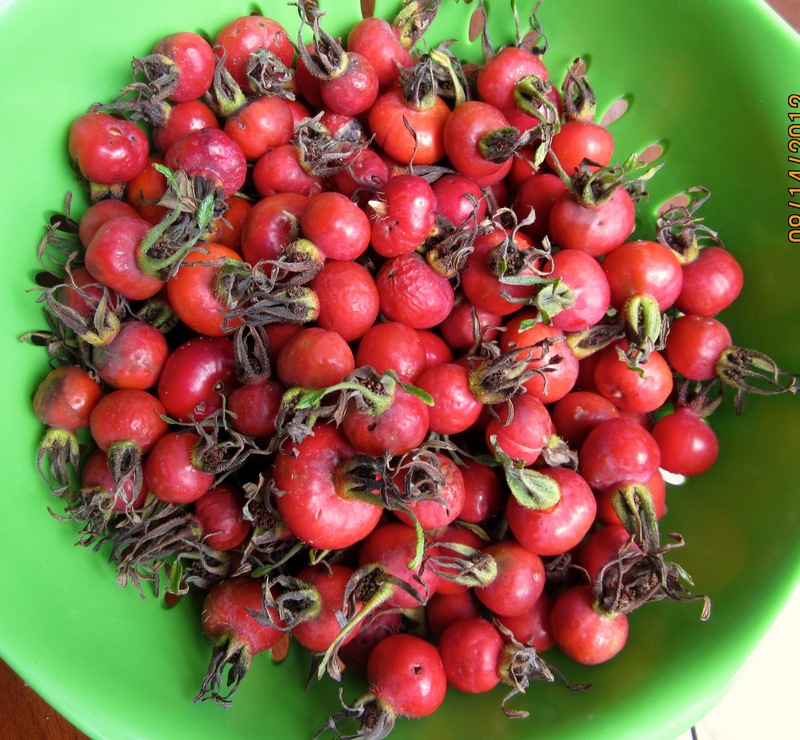 When we moved to Mount Desert Island and I saw the abundance of rose hips, I wanted to give it another try. Looking for an easier recipe, I remembered the “hobbythek”. In this old German TV show, Jean Pütz presented DIY methods for all kinds of interesting things – like cooking with wild plants and fruits. 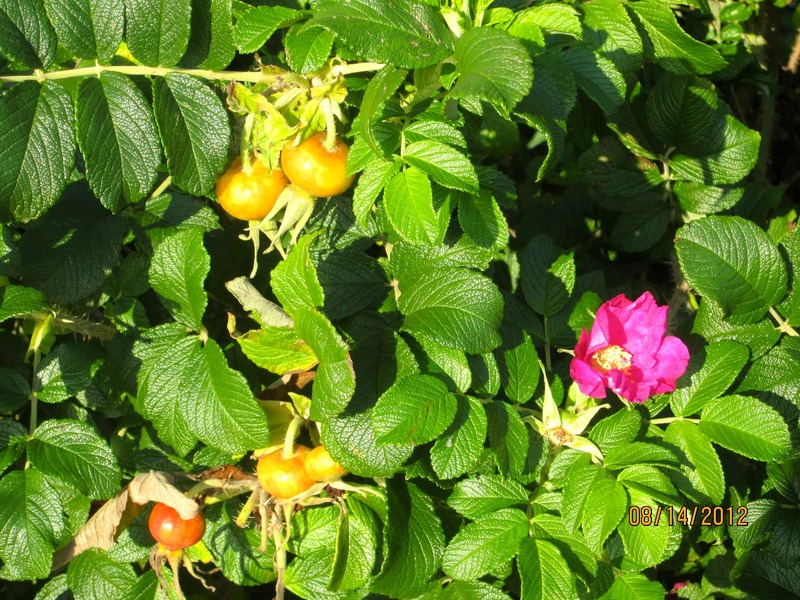 His rose hip jam doesn’t require tedious scraping of seeds, but just the removal of stems and flowers. 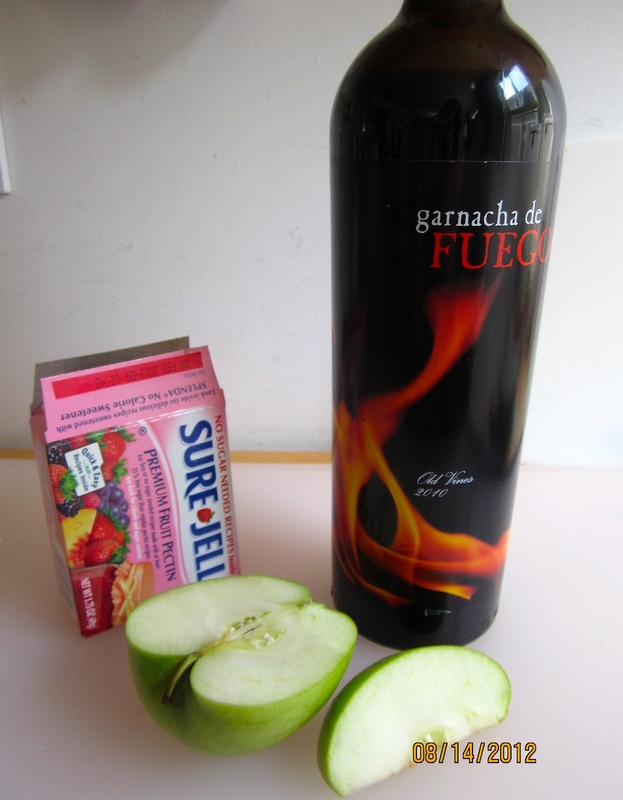 It utilizes the natural pectin from apples, and the fruits are cooked with red wine. You need some brawn to press the cooked fruit mass through a strainer. If you own a food mill it’s a little easier. Do not try to strain all those fruits at once – your sieve or food mill gets too clogged. Process half of the mass, roughly clean your straining tool, and then do the the other half. This part is a bit strenuous, but the result is well worth the effort! The addition of lemon juice gives the mild rose hip flavor a bright note. Place 4 – 5 clean jam glasses on a paper kitchen towel. Wash rose hips. Remove stems and flowers. Grate whole apples coarsely. In a small bowl, mix Sure-Jell powder and 100 g of the sugar. In a big sauce pan, stir together rose hips, grated apples, water, red wine and remaining 450 g of the sugar. Bring to a boil, cover, and cook on low heat for 1/2 hour, stirring now and then. Put half of fruit mass through a strainer or food mill to remove seeds and skins. Transfer back to sauce pan. Clean strainer roughly, and repeat with other half of cooked fruits. Add lemon juice, and sugar-Sure-Jell mix, and stir well. Bring to a boil, and cook on high heat for 3 minutes, stirring constantly. This recipe was adapted from Jean Pütz’ TV show “hobbythek“. If you can get rose hips, try this, Karen. It's really worth the effort. Rose hip jam is so popular here, and I quite like it. But I have never made it myself. Thanks for sharing your recipe. Lovely post! Wow, Looks wonderful! I don't think we have rose hip plants over here! Wish we had! Would love to try this! These roses grow in East Asia, but not in the South, they like it cooler. I wish we had Rambutan, though….